Primal Fear strengths have always been manifold: strong and varied melodic heavy metal compositions, sharp and stirring lead vocals and vocal arrangements, a steady rhythm section grounded by Matt Sinner, and ripping guitar solos. All the perfect ingredients to make a solid metal album. Allow me to cite some great examples of each element. What can I say about Matt Sinner and Randy Black? Ever since Seven Seals I have been impressed by this duo. They do not disappoint here: together they kill on 'Six Times Dead' and 'Night After Night,' to name only two. Individually, check out their work on '5.0/Torn.' Additionally, to Sinner's credit, his lead vocals on the metal ballad 'Hands Of Time,' are truly amazing, as is the song! Finally, I've already mentioned that I'm a huge fan of Magnus Karlsson, and his work throughout 16.6 is phenomenal. In tandem with the always reliable and creative Henny Wolter, Primal Fear is more formidable than ever with a twin guitar attack. Take note of the of the Eddie Van Halen-like intro of '5.0,' but also the fret work on 'Riding The Eagle,' 'The Exorcist,' and 'Black Rain.' Outstanding stuff. 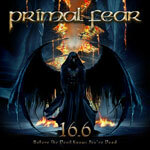 Indeed, Primal Fear's eighth studio release, 16.6 (Before The Devil Knows Your Dead) finds the band in peak form offering another splendid platter of melodic heavy metal that is both engaging and creative. There's a lot to listen to here, but the rewards are worth it. Of recent works, Seven Seals is still my favorite, but this one is certainly growing on me. Highly recommended! Indeed, Primal Fear's eighth studio release, 16.6 (Before The Devil Knows Your Dead) finds the band in peak form offering another splendid platter of melodic heavy metal that is both engaging and creative. There's a lot to listen to here, but the rewards are worth it. Of recent works, Seven Seals is still my favorite, but this one is certainly growing on me.